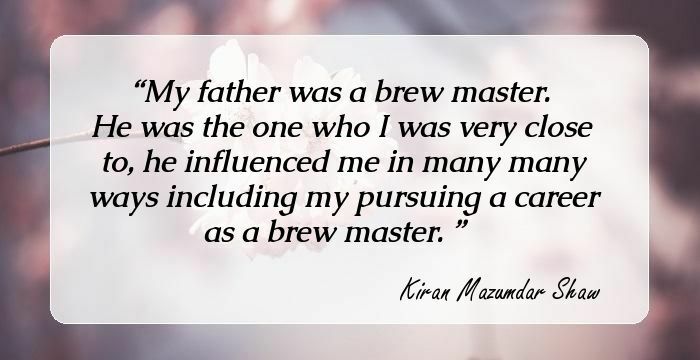 12 Inspirational Quotes By Kiran Mazumadar Shaw, The Founder Of Biocon That Will Reveal How Crucial Perseverance Is. It was the year 1975 and no one probably had heard the name Kiran Mazumdar Shaw. She had recently graduated and no one would hire her despite her top credentials as a Master Brewer. Now four decades later Kiran is the chairperson of country's one of the foremost biopharmaceuticals company, Biocon. But her path to fame was not a smooth one and she had to fall many times before reaching the zenith. It was her perseverance and dedication to carve a niche for herself that has landed her a coveted spot among the Forbes' 100 most powerful woman in the world. After her graduation, she wanted to work with enzymes but no one in the industry would give her a job as she was a female. So she set about starting her own entrepreniual venture. Here too she was faced with numerous challenges --from arranging funds to hiring people. Mazumdar Shaw reminiscences that the first fifteen years were the roughest phase of her life. However she never lost hope and today Biocon that initially dealt with enzymes diversified their spectrum to biopharmaceuticals. Despite an initial setback to the process, Kiran did not take the failure to heart and instead analyzed the cause of failure and improved on it. Here are few inspirational quotes from the tenacious entrepreneur Kiran Mazumdar Shaw herself. 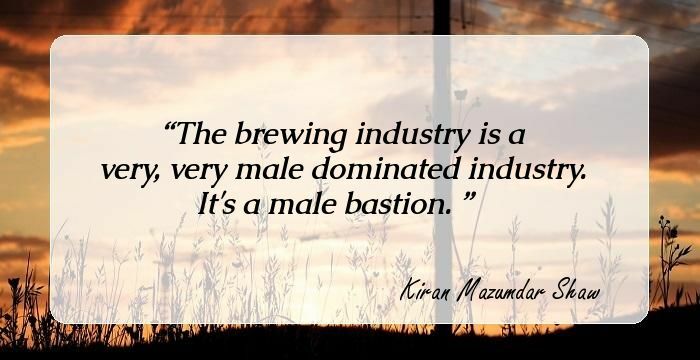 The brewing industry is a very, very male dominated industry. It's a male bastion. My father was a brew master. He was the one who I was very close to, he influenced me in many many ways including my pursuing a career as a brew master. I do serve on various boards and I'm very honest and frank, obviously. I am a very forthright person and I do, sort of, share my candid views on anything. My legacy is going to be in affordable health care. I am willing to invest in developing that model and the policies around it. My passion for innovation and my interest in the 'business of science' has seen Biocon commercialize many innovative platforms and products. As a traditionally risk-averse nation, India has rarely been at the forefront of innovation. Indian companies have mostly imitated others and became very good at it. One of my objectives when I started Biocon was to make sure that I create a company for women scientists to pursue a vocation. You have to build a culture of philanthropy. In a country like India, we need to be sensitive and caring about the poorer, more disadvantaged section of our country. I really believe that entrepreneurship is about being able to face failure, manage failure and succeed after failing. An entrepreneur's life is always a continuous journey. I have never let gender get in my way. It has taken me over 30 years to get from a garage to the huge campus that we have today. And it's been a long journey. 9 Inspirational Quotes By Chanda Kochhar, The Wonder Woman Behind ICICI, That Will Implore You To Achieve Your Goals. 22 Inspirational Quotes By Azim Premji The Czar Of The Indian IT Industry That Will Let You Overcome All Traces Of Self-Doubt. 10 Inspirational Quotes By Rahul Bajaj, Chairman Of Bajaj Group, That Will Compel You To Look At Businesses In A New Light. 18 Inspirational Quotes By JRD Tata That Will Force You To Move Out Of Your Comfort Zone. 10 Inspirational Quotes By G D Birla, The Founder Of Birla Empire, That Will Prompt You To Take Risks In Life. 12 Inspirational Quotes By Adi Godrej, Chairman Of Godrej Group That Will Motivate You To Face All Adversities Head On. 10 Inspirational Quotes By Lalit Modi, The Man Who Founded IPL, That Will Implore You To Live Life Like A Carnival. 9 Inspirational Quotes By K. P. Singh The CEO Of DLF That Will Implore You To Believe In Your Dreams A Little More. 16 Motivational Quotes By Nandan Nilekani The Co-Founder Of Infosys That Will Fill You With Passion.